Despite being titled "Monotypic", this article is actually about any tropical egg-laying fish that does not fall neatly into other groups or categories, or "miscellaneous fish" if you will. 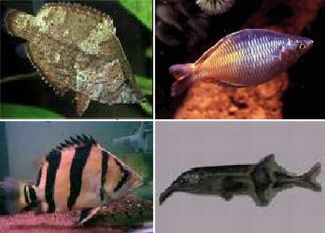 Many egg-laying fishes are monotypic - occurring as a single species within their genus. Some genera contain very few species and other species do not fit conveniently into the major fish groups. There is an extraordinary variety of fishes to choose for the aquarium within this category, from both brackish and fresh waters. Their physical characteristics are too varied to describe in general terms. These species are sometimes kept by hobbyists as interim choices before graduating to the more demanding field of marine fish-keeping. They have been chosen to demonstrate the range of fishes available to enliven even the smallest aquarium. Commercial availability of some of these species may be limited. This page was last modified 06:01, 9 September 2009.